Technology often has a tradeoff between privacy and convenience, and that's especially true when it comes to location-based services like navigation, real-time traffic alerts and local weather. We trade our location information in return for directions or the daily forecast. But often the tracking doesn't stop when we're finished with the location-based task we initiate. Both Google and Apple keep on tracking our location throughout the day. Here's how. Google gathers all of your location information and stores it in your Timeline. It’s a visual collection of all the physical locations you’ve visited over the last several years – and a way to review all the GPS data Google has stored on you. Most of the data in Your Timeline is collected by Google applications on your smartphone. This means that Android users will tend to have a more robust data set. Still, as an iPhone owner, my own timeline has plenty of data because I use Google Maps and Google. 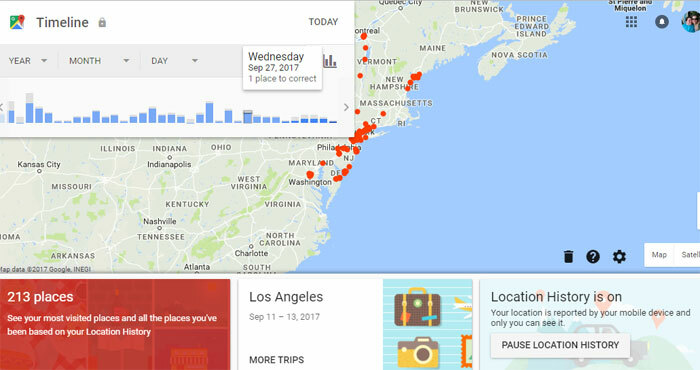 Google has started surfacing Timeline data as a reminder that it's collecting your location information. I've received reminders and email messages that highlight the locations I've visited. And, you can always view your location history by visiting your timeline at https://www.google.com/maps/timeline. There, you can pause location tracking, remove stops and edit the information collected. You'll see that it even recorded a fishing trip I took over Labor Day weekend. Google doesn't just track your when location when GPS is on, it also uses data it collects from your Wi-Fi and mobile network use for faster and more accurate tracking. So if you don't want Google tracking you, you need to go into Settings > Security & Location > Location. iPhone users are subject to similar tracking by Apple, which uses Bluetooth, GPS, Wi-Fi and cell tower locations to determine your location. 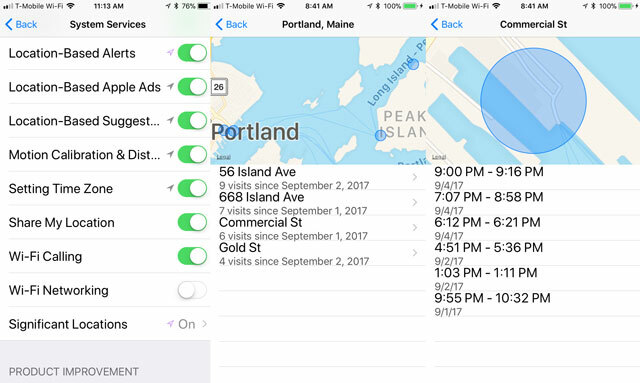 Apple lets you determine when you share your location information with apps, enabling you to share "Always," "While Using the App" and "Never." In addition to apps you may have loaded, there's a feature called Significant Location (formerly called Frequent Locations). In describing Significant Locations, Apple says "Allow your iPhone to learn places significant to you in order to provide useful location-related information in Maps, Calendar, Photos and more. Significant Locations are encrypted and cannot be read by Apple." To gain access to Significant Locations, go to Settings > Privacy > Location Services > System Services > Significant Locations. To see data in Significant Locations, you have to supply the passcode for your Apple ID or use the fingerprint reader. Once you're in, you'll see a list of places you recently visited. Selecting one will specific addresses and times you visited. One tap enables you to clear all of your data. For iPhones, you'll only see a few months worth of location information. Thank you for this. Lately, once I’ve left a store I’ve been getting a notification on my phone, as I’m leaving the store, asking me for a review on my shopping experience. That’s very creepy and invasive. I almost never leave reviews/comments because my privacy is very important to me but decided this was worth commenting on. Obviously I must have installed something on my phone recently that has allowed these people to send me these notifications. My phone is an LG and I’ve just reset some of my settings, hoping this problem doesn’t continue. I use iOS and always tick either Never or While Using apps. I use Duck Duck Go as my browser on Safari, not Chrome. I do leave Significant Places locations on so Apple Maps knows where I’m going, yes. Since Apple doesn’t show me ads or use my info for ads, (you have the option of turning that off in Settings so it won’t show its own ads when you’re near an Apple Store) I’m ok with that.